One of the app marketer job specifics is that their work starts when product development is still in progress. Why should marketers contribute at this stage? I think the key to a successful app strategy sits in the planning and reasoning of the app itself – what is its function and who is the audience? For this reason, the product marketing component is quintessential for its success. Ideally, a product should not develop something based on sterile functionalities without considering whether all of those are relevant for all the markets where the business wants to launch the app, whether marketing has all the tools available to market the product effectively. Let’s cover a bit the points raised here, started with why develop the app in the first place. When it comes to apps associated to web businesses users expect to find one or more of the following: exclusive offers and discounts, a simplified version of the site where everything but the essential service functionalities has been stripped away. And Google is pushing the industry away from web wrappers by developing more features that only native apps benefit from. Product functionalities wise, deep links, for instance, are often overlooked when developing the app, although it’s a crucial component of being able to drive good engagement campaigns. As a marketer, what you aspire is to drive campaigns and messaging that hits the right user at the right time towards the desired action. That last part of “the desired action” is a product marketing result, whereby the interaction of the user with the product after being hit with a communication works seamless and precisely to the intended point. Imagine how frustrating it is to click on a link to an offer, for instance, and you land on the homepage, on a generic page or on some section of the app that has little or no cues to that. You’ll probably navigate around and see if you find anything if it’s not placed intuitively – you get out and you’re annoyed! There is also the matter of MVP (Minimum Viable Product) efficiency – developing features after launch instead of before often is more costly and painstaking. Why? Let’s consider the following scenario: if the app accompanies a mobile web established business, then you usually fight with legacy issues. Making a change in the app can mean making changes in the web product, which may mean confronting some tech workarounds from the past. Sometimes the end result is the best marketing tech compromise a company can reach. Lastly, product and marketing transparency over potential limitations makes for efficient planning. Within this teamwork, product developers should be aware of the limitations marketing will have in taking the product to market by not having certain things and vice versa, what will be the cost of opportunity in changing some tricky aspects in the product or the backend. Having this conversation shortens the planning phase because you don’t work on scenarios that will never be, but you can already take into account the pitfalls. It also unifies all teams around shared responsibility rather than passing the hot potato. How and where is app marketing approaching audiences outside app specific ecosystem? What other channels should be part of the marketing mix? To answer this, we have to realize that app discovery with intent doesn’t happen within other apps. By that I mean, when we think of an app that could solve a need or look up the app of a brand we are already familiar with, of course, we’re not just going to wait to be hit with a display ad in other apps, even if those are Facebook or Youtube. Developing web presentation sites for app only businesses or leveraging the website of already established web businesses for upcoming apps is a great way to organically introduce users to your app while they are in an active research phase. Smart banners enabled for mobile usage of the sites can amount to a quarter of your total installs – free installs to leverage your acquisition costs. Traditional media like radio and TV are still very efficient channels to push an app, even though they are often bypassed because in the indie app ecosystem these are very cost prohibitive. However, if an app wants to move beyond the product itself and build a brand around it, these are very efficient channels. The possibility to now do smart buying for outdoor media, based on where your data indicates your users are, makes for an excellent fit for service, location, and timing. The app market has been highly competitive for years. How much are branding, transparency, and trustworthiness weighting in turning prospects to users? The latest Facebook scandals have been raising some awareness as to how much access these apps have to our personal information and also how they use it. A growing number of people check app permissions immediately after installing it. Too much access that doesn’t make sense for the purpose of the app and its usage comes into question. It’s healthy friction that makes for a good app with good usability, but it’s also a challenge for the product marketer. You want to be transparent as to what your product will offer, access and provide a good onboarding experience, but you don’t want to make it overwhelming or make people ask themselves “is this app really ok? Maybe I should look at alternatives.” It’s a delicate balance. When it comes to brand, one must acknowledge that 80% of app store searches are branded terms. ASO (App Store Optimization) has grown to be more a discussion about conversion and relevance rather than one of discovery and how to boost your installs astronomically. To that point, a company needs to focus on all the things that build a brand’s reputation, starting with the product that needs to be a lean experience and work flawlessly to client support, answering questions and reviews. 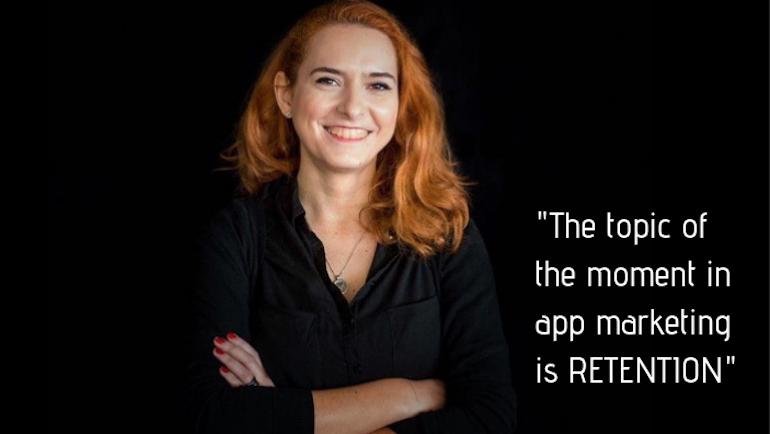 In app marketing, your product makes or breaks the marketing. And a clear testament to the increasing weight of product performance in marketing comes from Google Play. In their last year’s ranking algorithm changes, app engagement and crashes have been given a lot more importance. I would say the era of gimmicks to boost rankings artificially, the “fake it till you make it” approach is slowly coming to an end. Star ratings on app stores are still essential for trustworthiness and converting customers. A star rating of 4.2 is the golden number across industries. Why this specific number? It’s a psychological thing really – if it’s 4.9 or 5, you know they’ve been doctored. If it’s 3.5, product or service is probably quite bad. A range of 4.2 to 4.5 indicates performance as expected. What are the most effective & responsive ways to communicate with app users? At the moment, one needs to consider the following: SMS, email, push notification, in-app notifications. Being able to learn from users’ choices and serve them messaging tailored to their preferred ways of responding helps to optimize by deciding where it makes sense to invest time and effort. Optimizing app user engagement is probably the most significant topic in 2019! 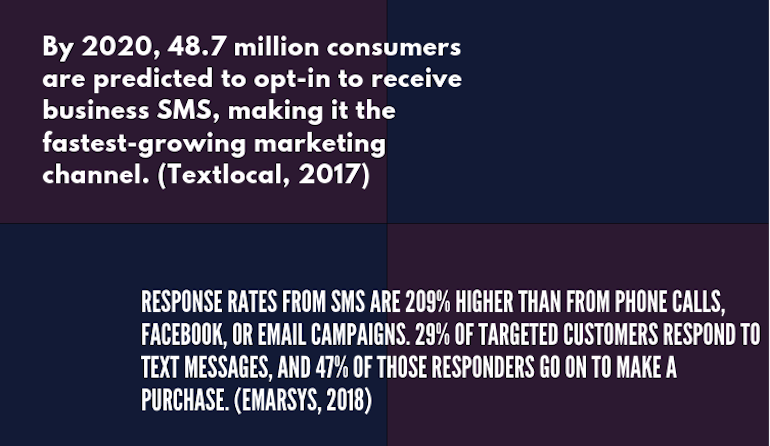 They say that SMS has made a comeback in the last two years, but I don’t think it ever left. As push notifications become a habitual thing, people start responding to each of the above means in almost equal measure. Of course, it depends a lot on the industry: in e-commerce, push notifications are absolute rulers in engagement. 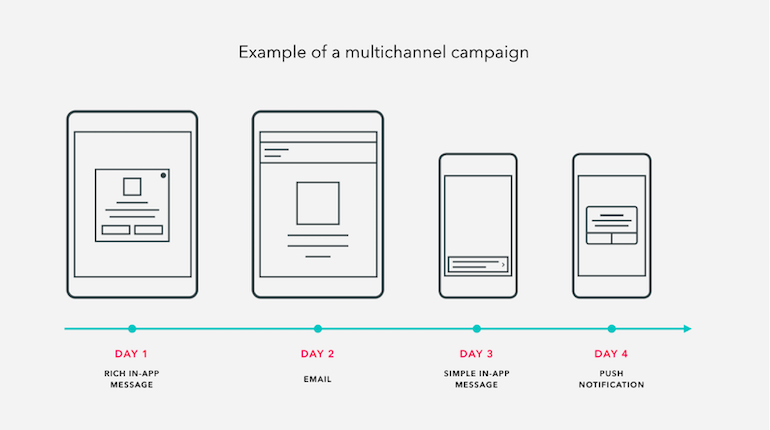 If you’re only sending your messages in one channel, you’ll miss out on segments of your users. Not everyone will be opted in to receive push notifications from you, or will be on your email list, or will happen to notice your outreach even if they opted in to those channels. Multichannel approaches allow marketers to reach their users on whatever channel that the user prefers. What’s more, you can create campaigns that use different channels to reinforce a message with multiple exposures, and leverage different tactics to tell a richer story. Marketing strategies and tactics for both online and offline campaigns rely heavily on user behavior. What are the most resourceful and relevant user behavior metrics in app marketing? The metrics differ from business to business. I would say it’s rather the methodology that is important in identifying user behavior and drop off points. Based on findings, product and marketing can work on identifying potential frictions at various stages of app usage and improve those steps. Also, they can develop campaigns and strategies to motivate users to proceed to the next level and most notably to retarget users who have dropped off at certain stages. Such retargeting efforts are usually more cost-effective compared to acquiring a new user all-together, but it has to be said that time and nailing the right timing is critical in such cases. Then, of course, it’s the stickiness of the app and how engaged the users you acquire today will be in the following days. So looking at retention by cohort is a must to have the correct and accurate image of how valuable your acquired users are and it speaks to how likely they are to cover the initial acquisition cost and turn a profit. What are the main differences in designing an app marketing strategy for app only business as opposed to app+web business? 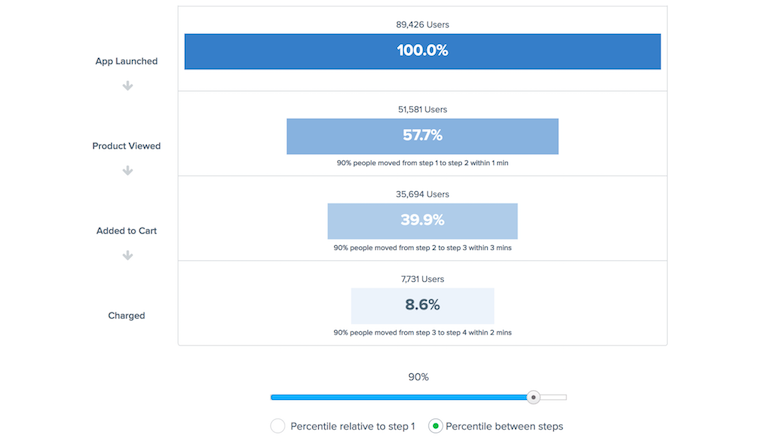 With app only businesses, the only numbers that inform your business performance and user journey analysis are the ones you collect from the app, which is a pretty straightforward process. That means it’s easy to build in-app event funnels and to measure return on investment, measure LTV (Lifetime Value) and so on. When you’re looking at web+app, you’re increasing the number of platforms you’re paying for the same user, sometimes in the same channels. Make sure you don’t double count results. Such businesses need to be able to identify their users cross-platform first and foremost, finding that one crucial event on which you can pass on some sort of user ID across platforms. You can then look at what the app brings extra in terms of revenue or retention. Sometimes it doesn’t generate additional revenue itself, but it’s a great medium to keep your customers engaged through tailored communication. In this context, putting time, money and effort into encouraging your web users to use the app as well is a long term investment in retention and lifetime value. Also, a business should not look at spend on app campaigns relative to revenue generated on app in isolation – that is the number one trap in such instances. What are the must-have skills and expertise a marketer is required to master to set-up and manage successful digital marketing for apps? As an app marketer, you live in three worlds – customers, product, and marketing (obviously). And you bring them together. As with traditional web marketing, it’s always preferable to master at least one area of marketing, whether that is ASO or paid UA (User Acquisition) or retention. When you know your domain well, it’s easy to build bridges with other areas of marketing and understand the connections. In app marketing, you need to understand the synergies between the various marketing efforts: ASO, paid acquisition, engagement efforts. App store optimization is different than SEO in that it has a stronger impact on performance results. Data and analytics are super important in this field. It’s what nails down the cross-platform strategy. One needs to get comfortable with analytics dashboards and looking at the data first hand. A data person can help you model numbers, but they would still ask “Where do you want to get to with this?”. The app strategist is like an orchestra conductor – he needs to know what each instrument is supposed to sound like individually but also imagine how they should all blend to make divine music. Can you share a few relevant resources and industry news websites for the app marketers to stay in touch with the latest news, trends, and events in the app marketing? As a rule of thumb, leading app marketing, attribution, and analytics platforms have great blogs. And they are all worth checking out once in a while. The Localytics blog has excellent case studies around engagement tactics and statistics. The Branch blog has solid articles and best practices for everything from acquisition, retention, deep linking to smart banners. AppAnnie, which is the leading competitive intelligence platform has interesting stats and each year indexes the best performing channels, ad content, and trends in app marketing. I am a great fan of Twitter as a learning resource. If you want to cast a wide net and always mine for new goodies, this is a perfect channel to peruse. Just follow hashtags like #appmarketing, #aso or #mobilemarketing. Great learning resources are Facebook groups – people share a lot of information there and the actual challenges they face. It’s also an excellent opportunity to ask questions: people are usually very humble and keen to help. What are the 2019 app marketing trends and app topics we must be aware of? I just came back from the App Promotion Summit London, which took place at the end of last week and I feel like by far the most important topic of the moment is retention. How to keep the users engaged and coming back for more? How to leverage product features, your app store listing and turn your users into brand ambassadors. I feel like the discussions have moved away from user acquisition hacks now. Understanding the interdependence between acquisition and retention and between channels and platforms is the key to success in 2019. It’s all about healthy, profitable, smart growth. To this purpose, data has become paramount – probably the next big thing for 2020 discussions. And of course, with growing competition in the app space and marketing efforts, you also have the topic of install fraud. For companies that do a lot of media buying outside the Google, Facebook and Apple space, this is something they need to be on top of. I also feel like more information, and practical takeaways are flowing out there – learnings and best practices have been democratized in the past year, which is probably a sign that the domain is becoming more mature now so more information of substance is expected. Any last words of wisdom for aspiring app marketers? What I usually advise is – with generic app advice, take everything with a pinch of salt. No other business is like YOUR business even if you sit in the same vertical. There is often frustration of overpromising of results and forecasts that come from various articles and papers. The key is to start from what you know from your app and your particular business and intersect that with these articles. Sometimes they do answer your question or need precisely. But more often than not what you get mostly is a test idea, a hint at which data to look. Eliza has over 13 years of experience managing cross channel, cross-platform digital projects, developing and implementing strategies and innovating online business models and digital operations in multinational environments. Experience in a range of verticals: web services, antivirus, and security, invoicing services, personalization apps, igaming, digital printing, and ridesharing. You can connect with Eliza here.